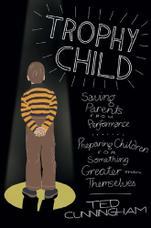 Written for every mom who helps too much with homework just to impress the teacher and every dad who takes credit for his daughter’s soccer success, Trophy Child will give parents the encouragement they need to nurture their kids into who God created them to be. Our culture’s obsession with achievement often leads parents to form expectations for their kids based on the world’s standards, not on the Bible. As a result, their kids feel they never measure up. Trophy Child will help modern Christian parents create a home where children find success in following their heavenly Father’s leading for them—and readers know the joy of seeing their children embrace their full potential as children of God.